Ok so I admit that’s a provocative title. But in many countries taking action on the two c-words “climate change” just isn’t a key priority. There are, perhaps, good reasons for this. A lot of countries feel there are more pressing needs to deal with rather than a distant, future problem. Take Nigeria for example. Nigeria has a huge population of 158 million people, set to increase to at least 210 million by 2020. About 50% of Nigerians live on less than $1 a day, and as this recent Economist article explains, its infrastructure is patchy and in disrepair. Added to this, most African countries have low emissions compared to the rest of the world, which makes them feel climate change is really a “developed world’s problem”. This sums up some sceptical reactions I’ve faced – albeit expressed more politely – at the African Development Bank annual meetings this week. I have been invited here to make a presentation on and discuss green growth and the opportunities it might present for African countries like Nigeria. Whilst there are a good number of participants here that work on renewable and energy efficiency projects, most are here to make new deals on infrastructure and other private sector projects all over Africa, which will help meet Africa’s estimated $31bn annual funding gap and provide new jobs. But the key thing I’ve realised is that mentioning the c-words “climate change” to many of these participants isn’t a useful way to start the conversation. Instead the tack I’ve been taking is based on a pioneering approach that the DFID office in Nigeria is hoping to test, which shows how tackling climate change can address immediate concerns. They start with growth and jobs – specifically, infrastructure development in Nigeria’s power and transport sector. Nigeria has very poor power infrastructure, with frequent blackouts. 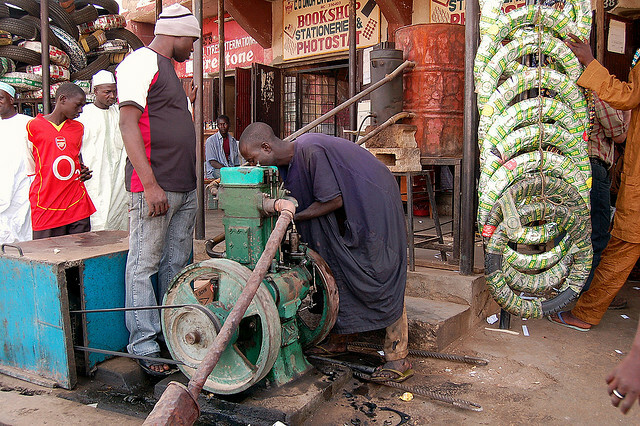 Nigerian businesses and households therefore either don’t have access to electricity, or rely on self-owned diesel generators. Although diesel prices are (unsurprisingly in an oil exporting country) relatively low compared to other countries around the globe, it’s still costly compared to powering homes with grid-based electricity. Overall, Nigeria’s power use relative to GDP is among the lowest in the world: as shown in this creative infographic it equates to each person being able to run a fridge for just one month a year. This is a real problem for growth and jobs. But, as the African Development Bank’s Vice President Bobby Pittman said at the green growth event I presented at, it is also a huge opportunity. Investors that can provide power at lower cost have businesses and households that are clearly ready to pay over the odds for power and can still make a profit. However, many investors are waiting for the government to reform the main electricity grid market to capture these opportunities. But this lack of reform itself presents an extra opportunity for renewable development. If renewable options – such as solar – are any more reliable and cost-effective than diesel, they could have a huge market in Nigeria, directly replacing existing generators and giving new homes and businesses access to energy. And if the grid reform did take place, opportunities could be created – as takes place in the UK – for businesses to sell extra renewable power onto the grid, and reap profits. We may well see the same kind of rise in solar penetration as we have seen with mobile phones – whose rise in Africa was stimulated more by a lack of traditional, land-based communications infrastructure than anything else. Nigeria’s transport sector is slightly different. Here, the opportunities lie more in considering the likely costs of congestion now. Nigeria’s cities will need to accommodate 65 million more people by 2030, almost doubling the urban population. If personal car usage rises, congestion and the productivity losses that arise from it will be awful. This means that investing now in light urban rail, bus-rapid transit, or even high-speed rail to capture customers and allow them to commute in and out of cities, may make good sense. Recent improvements in bus services in Lagos have already cut journey times by up to a third, but more will be needed. GTZ call this the “Avoid-Shift-Improve approach” and cite several examples of developing country cities that are using it successfully. DFID Nigeria is now looking at adapting the design of a new Infrastructure Advisory Facility to allow these kinds of opportunities to be explored over the next few years. If approved, the Facility could have transformational impacts, without distracting the Government from the crucial need to achieve growth and poverty reduction. Who knows, Nigeria might prove that even countries that don’t want to mention the climate change word, can be at the forefront of green growth.